Embryonic stem cells (ESCs) derive from the inner cell mass of the blastocyst. They differentiate into three primary germ layers: ectoderm, endoderm, and mesoderm, giving rise to virtually all the cells of the body except the placenta. ESCs can be grown in the lab in an undifferentiated state and are capable of long-term growth and self-renewal. Two important transcription factors, associated with maintaining the stem cell population, are Oct4 and Nanog. ESCs will differentiate in culture and spontaneously differentiate if allowed to clump together. Through manipulating the conditions under which ESCs are grown, it is possible to get ESCs to differentiate into different cell types. 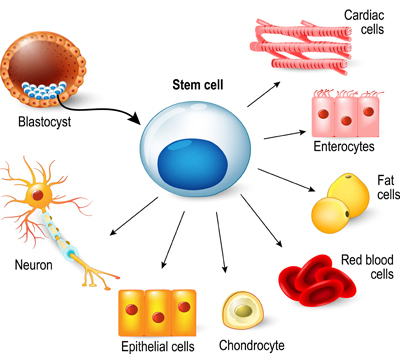 Popular embryonic stem cell markers include: CD49f, CD117, CD324, CD326, Klf4, Nanog. Takahashi and Yamanaka (2006) found that under certain conditions a terminally differentiated cell could be reprogrammed into a pluripotent stem cell, capable of making any cell in the body. However, these induced pluripotent stem cells (iPSCs) are less efficient at differentiating into all the cell types compared to ESCs. Since this initial discovery, the technique of creating iPSCs has been refined and there is a considerable interest in their potential for drug development, modeling disease and transplantation medicine. Genes that are important for maintaining ESCs are also involved in the process of reprograming differentiated cells to form iPSCs, including: Oct4, Sox2, Klf4, c-Myc, Lin28 and Nanog. Popular iPSC markers include alkaline phosphatase, CD13, CD30, Nanog and Sox2. Both ESCs and iPSCs have the potential to become multiple cell types, resulting in a unipotent, terminally differentiated cell with a specific function. As both iPSCs and ESCs start to differentiate into different lineages the markers that they express change as they commit to different cell fates and lose their pluripotency. For instance, cardiac and hematoendothelial progenitors can be identified by the expression of the cell VEGFR2 and CD34, whilst Nestin can be used to identify neural progenitor cells. Bio-Rad offers a broad collection of antibodies useful for studying pluripotent stem cells and those in the early stages of differentiation. Click on the following related links to explore our product range by marker or use the filters in the table below to sort the attributes in order to find the antibody that fits your exact requirements. Kopper O and Benvenisty N (2011). Stepwise differentiation of human embryonic stem cells into early endoderm derivatives and their molecular characterization. Stem Cell Research 8, 335-345. Loh Y et al. (2006). The Oct4 and Nanog transcription network regulates pluripotency in mouse embryonic stem cells. Nat Genet 38, 431-40. Mansergh FC et al. (2009). Gene expression profiles during early differentiation of mouse embryonic stem cells. BMC Dev Biol 9, 5. Meissner A et al. (2007). Direct reprogramming of genetically unmodified fibroblasts into pluripotent stem cells. Nat Biotech 25, 1177–1181. Nichols J et al. (1998). Formation of pluripotent stem cells in the mammalian embryo depends on the POU transcription factor Oct4. Cell 95, 379-91. Takahashi K and Yamanaka S ( 2006 ) . Induction of pluripotent stem cells from mouse embryonic and adult fibroblast cultures by defined factors . Cell 126 , 663 - 676. Wernig M et al. (2008). c-Myc is dispensable for direct reprogramming of mouse fibroblasts. Cell Stem Cell 2, 10-12.